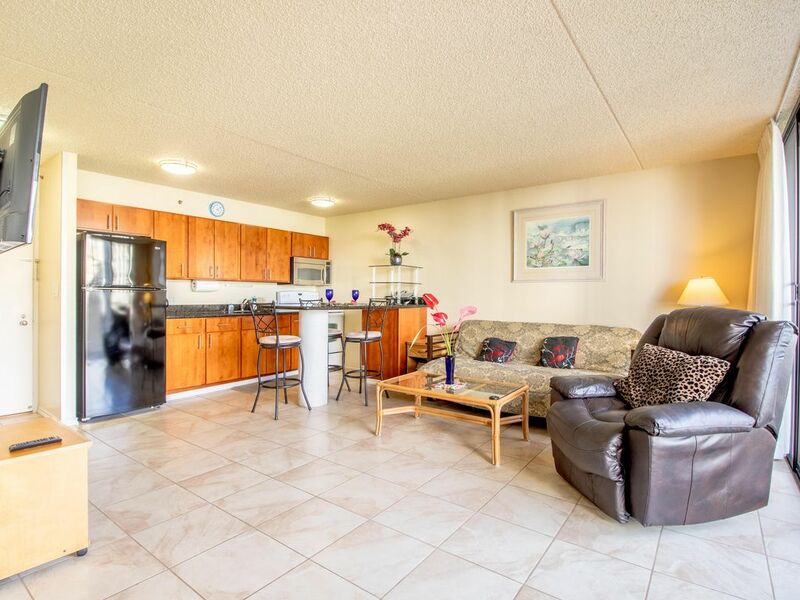 We offer an upgraded deluxe quiet, air-conditioned one-bedroom suites at the Waikiki Banyan (201 Ohua Ave.), conveniently located in the prime area of Waikiki, one block to world famous Waikiki Beach, shopping, restaurants The Bus Stop is only steps away. - A huge recreation deck on 6th floor with large swimming pool, 2 jacuzzi, snack bar, tennis & basketball court, sauna room, barbecue grills, showers and restrooms. Full kitchen: Well equipped with range/oven, microwave, large refrigerator, coffeemaker, toaster, rice cooker & cookware. Ample eating and cooking utensils.. Large kitchen sink with disposal. Our low rate is for occupancy up to 3 persons, including a baby. A 4th person will incur an additional $50 per night. Maximum occupancy for this unit is 4 persons. Only registered persons permitted to stay in unit. Unauthorized persons staying in unit will be immediately evicted and a $200 fine imposed. For rates, please refer to rate schedule. 2. Fully refundable $200 Damage Security Deposit. 4. WIFI available upon request at $3/ day. All 4 items above payable upon check in. We do not accept bookings more than 9 months in advance. We always check in and check out our guests in person. If you are interested in renting this beautiful unit, please submit a Reservation Request. We look forward to hearing from you. Aloha. In each one bedroom suite, there is a single telephone line with 2 phones & answering machine. One phone in the living room, one in the bedroom. This telephone line enables dial up internet access. Powerful window unit A/C at the Waikiki Banyan. Large refrigerator. At the Waikiki Sunset, the refrigerator has a ice maker. In each one bedroom suite, there is a large refrigerator (some with ice maker) stove with oven, sink with garbage disposal, microwave, coffee maker, rice cooker & toaster.